Many of us know that the Nobel Prize is frequently used for political ends, rather than to award actual achievement in a field. Hence why the “Peace Prize” went to Barack Obama for promoting collectivism cloaked in the euphemism of “bringing people together” prior to him entering the White House. So why should it come as a surprise that 10 years after Al Gore won his shiny medallion and cash from the Nobel folks, his predictions about the Earth’s temperature have proven to not only be wrong, but the complete opposite of what has actually occurred? Indeed, a decade on, global temperatures are lower than they were when Gore got his proverbial pats on the back from Nobel’s clubhouse. But why bother criticizing unreliable datasets and their widespread propagation in pop media when the Nobel organization can perpetuate the myth and work toward the collectivist agenda of global carbon taxes and massive regulations on industries ranging from coal plants, to oil refineries, to wood stove manufacturers, and light bulb makers? Why bother giving the Nobel Peace Prize to, say, a woman who saved 2,500 lives in World War II, when one can hand it to Gore and the corrupt UN Intergovernmental Panel on Climate Change (“IPCC,” which has been proven to have manipulated data and excised dissent) in 2007? 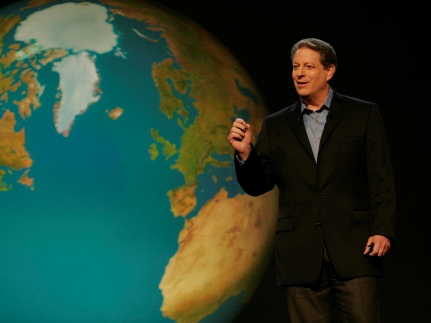 And, of course, Gore’s new “An Inconvenient Sequel: Truth to Power” (really?) has flopped, with fewer than 250,000 people watching, and just $2 million in gross revenues after nearly three weeks wasting energy and burning carbon to project it on screens. But pay no attention to the fact that many people are avoiding his second flick because his first was shown to be so full of falsehoods. Thankfully, scientists and non-scientists around the globe are standing up against the rhetoric and data manipulation of Gore, Michael Mann, the IPCC, and others involved in Climategate. From climatologists resigning to escape the politicized science at universities, to Gore and most other proponents of climate fascism assiduously avoiding invitations to debate evidence of man-made global warming, or lack thereof, people who are interested in unalloyed information, in conversations cleansed of political manipulation, are becoming increasingly aware that what Mr. Gore and his allies offer is not honestly presented, or even honestly collected and studied. We understand very well. That’s why we publish new information about what the climate has been doing for two decades (i.e., not warming), while they try to hide and overlook the truth.